First and foremost, happiness is a relative emotion. What makes me happy doesn’t necessarily mean will make you happy. However, we all like being happy, don’t we? I feel happy, especially when I do something genuinely good for someone else. The law of attraction states that before something good happens to you, you must be calm, happy and you must know what you want. You give something to the universe and the universe reciprocates that. The loop then goes on and on. Now, there are always exceptions to this law. After all, laws and rules are made to be bent and broken. Nevertheless, I’m not going to talk about the bad guys today, instead we’re going to take a look on the bright side. One way or another lottery truly brings the best in people. We all know him, it’s Dan Bilzerian. He fascinates his followers with his lavish lifestyle. His love for weapons is one of the most distinctive features which make him stand out from the pack. On top of this his parties are truly something to crave for. 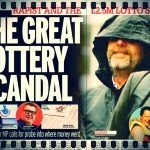 So what did this celebrity do to take a place in our article about the lottery? It turns out Dan really knows how to get that attention he wants and arguably he deserves. Dan Bilzerian went to his bank and got out $100,000 in cash. After a few pictures posted on Instagram he stated he’s going to buy $100,000 worth of lottery tickets and he’s going to give it all away to his trusted and loyal Instagram fans. He was involved in quite a lot of scandals due to his passion for weapons, drugs and wild partying. However, this is one of the selfless things he could’ve done for the lottery community. And so he did! 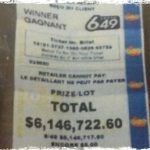 He did give all the tickets away with an objective to make one of his followers a millionaire. The hype was real and even I noticed. I’m not much of an Instagram fan, but somehow this information reached me. Life was undoubtedly good to Dan and actions like this just make us love him more. This time around the lottery tickets reached his fans, but sadly nobody won the $1m. Personally, I don’t know if this is the right course of action. I mean, it’s absolutely selfless, but isn’t this moving away from your fortune? Like, finally Lady Luck smiled upon you and you’re giving it all away, well, almost. Roy Cockrum won a little under $260m. At the time this was the biggest ever recorded jackpot prize on the grounds of Tennessee. Roy already being in his late years didn’t actually know what to do with his money. All of his life he was helping people selflessly. Even when he didn’t have much to give he was still giving it all away. So how did this prize affect him? You guessed it! He kept a really small portion for him and donated the rest of his money to a long list of charities. Now he didn’t have to worry about the money. Believe me, having so much money can be a burden. He found happiness. Apparently money was not that much important to him. Happiness is truly individual. I used to this back in the days. I was going to pretend like I am something, like I did something. Eventually my body will believe me and the universe as well. Fake it till you make it, or in this case be IT. A few years ago a couple from the UK decided to play a game with their friends and family. It was Christmas and they wanted to have some fun. This game will eventually fail, as they faked it till they made it. They were the average UK family, yes, they were. So they opened a champagne bottle, took some pictures pretending they’ve won the lottery. Soon after that they realized they’d actually won. It seems like this short preemptive party was the trigger that made their lottery tickets the winning ones. Unknowingly, they tapped into the unlimited power of the law of attraction. You should try this in other areas of your life. You’ll be surprised how effective it can be. Aaron Smith is the role model all lottery players should follow. Let this story be the confidence boost you need to win the lottery. Note I’m stressing quasi lottery winner since the dude didn’t really win the lottery, but he did win. I wish people like this win more often. He just has the kindest heart. It all started out as a prank organized by Magic of Rahat. He previously went to the lottery retailer and gave him $100 bills in total of $1,000. He afterwards went to this homeless guy and gave him a lottery ticket telling him it’s a winning one, but that he thinks he should have the money. They then both went to the shop and boy was he surprised. He immediately offered some of the money back to Rahat, but he refused. Since Rahat is quite the sensation on YouTube, the homeless person became a hit. Many other donated money to him. Today he has a roof on top of this head and is living a somewhat a decent life. Kindness does pays off. Sometimes lottery tickets don’t reach the right people. Then again, sometimes they actually do.